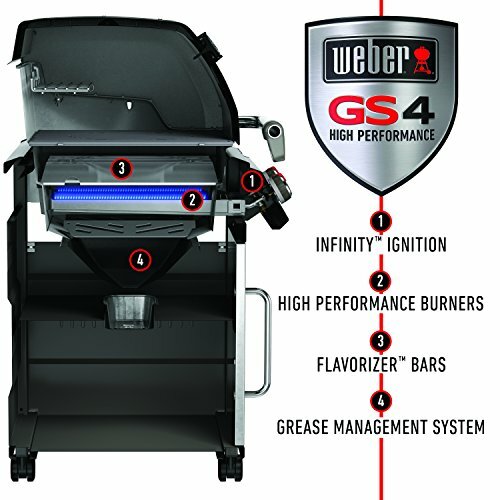 Weber has a long-standing reputation in the outdoor grill and cooking appliance niche. 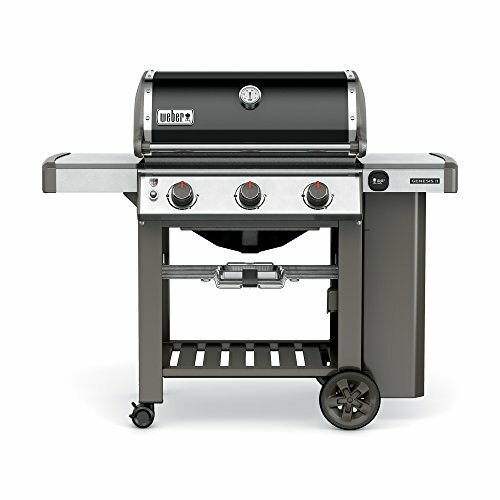 This includes liquid propane grills like the Weber 61010001 Genesis II E-310. It uses their The GS4 High-Performance Grilling System to offer customers convenience and efficiency. 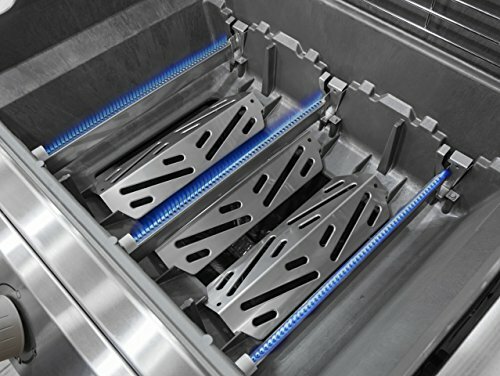 This type of grilling system was designed with the user in mind. If factors in nearly three decades of grilling experience, as well as culinary acumen. The components used in the Genesis II E-310 are purposely designed to be easy and intuitive to provide you with the most enjoyable backyard grilling experience possible. Each of the burner elements is designed to ignite easily. The shape of the hood and other features is also intended to impart heat and smoky flavor to the food being cooked, regardless of if you’re grilling on direct or indirect heat. The Infinity Ignition System is included in the warranty package, which is always a sign of confidence in the quality of a component. It is designed to light easily, every time. The Burner Elements were designed to provide a slight taper to the shape of the flame. This helps to maximize the distribution and consistency of the heat. Flavorizer Bars were also incorporated into the grate configuration of the Genesis II E-310. They help to catch drippings, causing them to be sear and vaporize for even more natural smoky flavors. At the same time, the gentle taper of the Flavorizer Bars also helps to direct any excess drippings or grease away from the burner elements to help minimize cleanup. 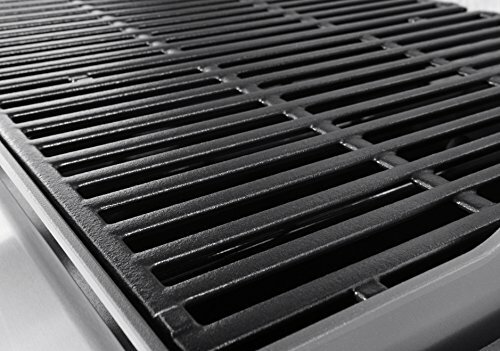 The Porcelain Glazed Cast Iron Cooking Grates help prevent food from sticking. 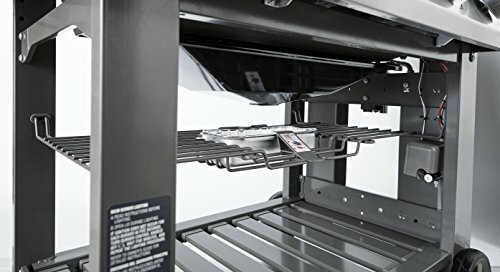 They are 513 square inches and the grill also includes a small warming rack. The Weber Genesis II E-310 requires some assembly. However, with some basic tools and a minor amount of mechanical skill, it should be easy for just about anyone to assemble. Average assembly time should take around three hours. The lid and side tables are very sturdy and made from heavy gauge steel. The pair of cast iron grates and have been glazed with porcelain to provide a durable, rust-resistant, semi-nonstick grilling surface. The simple plastic bumpers on the side tables feel a little bit on the low end, and don’t convey the same kind of quality you feel from the rest of the grill’s components. This theme is also carried through with the trim on the lid. With a special conversion kit, the Genesis II 310 can use natural gas. Just make sure you have a natural gas line available, and that the kit is available to order or to purchase from the retailer, before committing to the natural gas option. 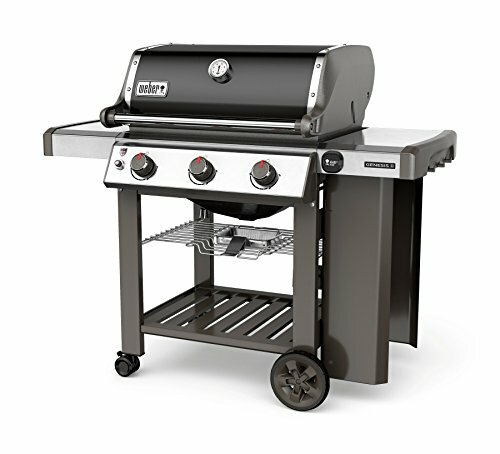 The grill features three propane burners and it is rated to 37,500 BTU. This is more than you typically see from comparable grills, which tend to run in the neighborhood of 25,000 BTU’s. 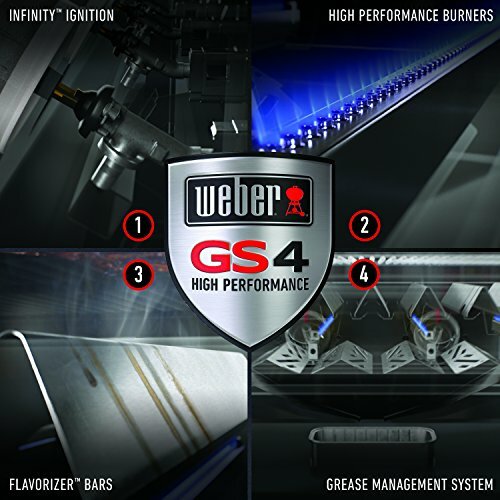 The Weber Genesis II 310 feature a 513 square inch cooking surface. This is more than enough space to grill for a significant number of guests. It also gives you enough space for hybrid grilling, which could come in handy for something like chicken thighs, where you grill on indirect heat until they are fully cooked through and tender. Then you can move them skin side down over direct heat to crisp and mark the skin. It also includes a warming tray which allows you to hold over the temperature of meat and vegetables that may have gotten done early. This is especially helpful if you are going to be cooking different foods like hot dogs for the kids and steaks for the adults. The GS4 grilling system is designed to be easy to light every time. 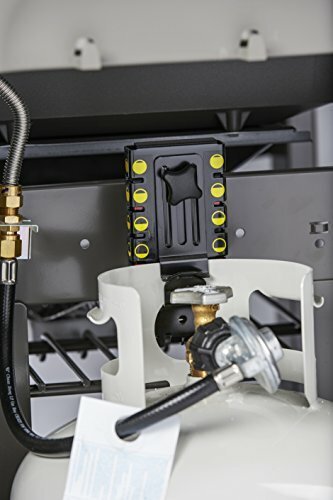 The three propane burners are rated to produce 37,500 BTU’s for superior heating. 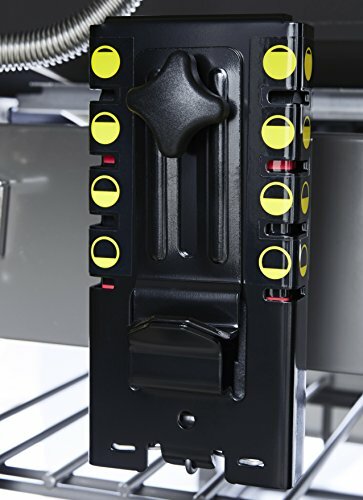 The innovative Flavorizer bars are designed to vaporize drippings for added aroma and flavor. They also help to redirect excess drippings toward the drip pan to reduce charred on spatter on the burners and improve cleanup. iGrill3 compatibility allows you to incorporate a Bluetooth accessory thermometer. It is designed to help you monitor your grill from your smartphone or other wireless devices while you are away from the grill. It has an effective range of 150 feet. 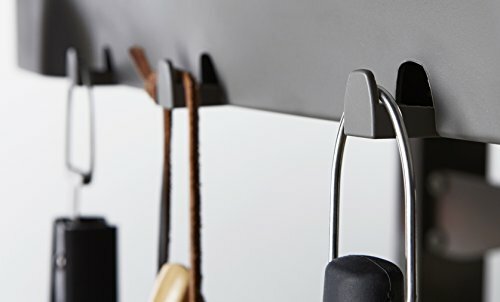 This can be very helpful for preparing dishes that require a long cooking time, or if you need to go into the kitchen to prepare the side dishes. Weber’s designers did their best to keep cleanup in mind while they were designing the Genesis II 310. 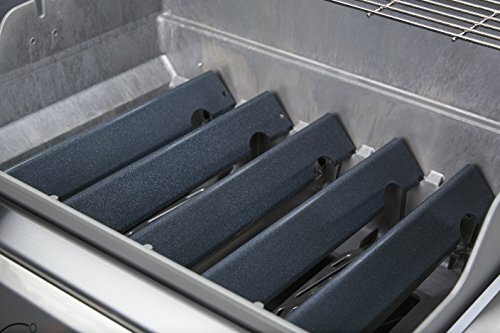 The grill features large components that are evenly spaced, which makes it easy to remove them for cleaning. The flavorizer bars also help redirect errant drippings toward the drip tray. The size and location of the drip tray might present a problem on a windy day. Since the area under the grill isn’t enclosed a strong breeze can potentially blow excess drippings out. This is also a potential problem if you are going to be cooking a large amount of meat. The Genesis II 310 comes with a 10-year limited warranty. This is a sign of confidence from the company in the quality of construction used in the components. However, it does not cover excess wear and tear from regular use. Inexpensive gas grills tend to cost more in the long-term in the form of replacement parts and excess maintenance. You don’t see these problems with the Weber Genesis II 310. 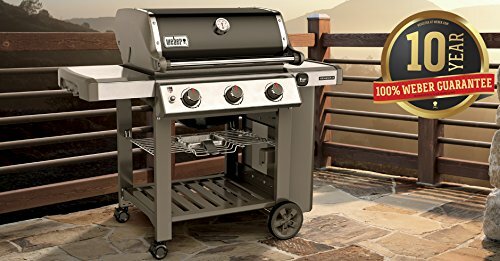 The quality of components and construction, as well as the backing of the 10-year limited warranty, will keep you grilling confidently for years. The Genesis II with its Infinity Ignition System integrated into the GS4 Grilling System, and the accessory iGrill3 Bluetooth compatibility brings you the cutting edge in modern-day grilling. This makes it worthy of its considerable price tag.